Will opposition play constructive role for better governance in Pakistan? Democracy is the ideal political system upon which the ruling party and the opposition can co-exist without having the goal of eliminating one another or living with the fear of being annihilated. Pakistan is a country that has remained prey to lingering governance, politically unstable and fluctuating economy during its past 70 years. The country has been ruled by the military dictators more than the civilian rulers ruled. However, of all the reasons that led the dictators to topple civilian governments, the political conflicts among the political parties were major reasons. The coup d’etat of Zia Ul Haq was not the over night mission of Army Chief , but it was the outcome of chain of events and protests of political parties paving the way to overthrow the Bhutto’s government. Moreover, to strengthen the mass protest against Bhutto, the Pakistan National Alliance (PNA) was made-up of nine anti-PPP parties. It included three of the country’s main religious parties, some moderate conservative parties and a few small left-wing outfits. Similarly, Ghulam ishq Khan, the 7th president of Pakistan who was elected on people’s Party’s platform toppled his own Party’s government accusing her administration of corruption, nepotism and other acts. This time, the political parties played very unprecedented role as Ghulam Mustafa Jatoi, a former member of Miss Bhutto’s party who had gone over to the parliamentary opposition, was sworn into office. This time a civilian president ousted civilian premier. Meanwhile, the second tenure of Benazir Bhutto became prey to tug of power politics as President Farooq Leghari dismissed Prime Minister Benazir Bhutto and dissolved the National Assembly in a decree alleging her for corruption, political violence and financial mismanagement by Bhutto’s government. The military coup in 1999 was not the exception of reasons as mentioned above. The political parties divided again over the petty issues and never started mass protests against the powerful military regime that time. In the recent times,the nascent democratic process started in 2008 when a civilian government formed government. The PPP government faced many challenges mainly pertaining to external and internal security threats and economic disaster were the main parts of the challenges faced by the Zardari government. After the general election of 2013, the government of Pakistan Muslim League-Nawaz (PML-N) faced severe opposition not by the opposition of PPP but the opposition by Imran Khan-led Pakistan Tahreek-e-Insaf (PTI). The 100 day sit in, political turmoil, economic loss, and unnecessary mass protests not only brought dent to country’s democracy but also hampered the already fragile growth of country as government and opposition were busy to deter any further coup and this diverted the attention of the government and opposition to heed real problems of the country. Unfortunately, the duty of an opposition was to oppose everything and to propose nothing. 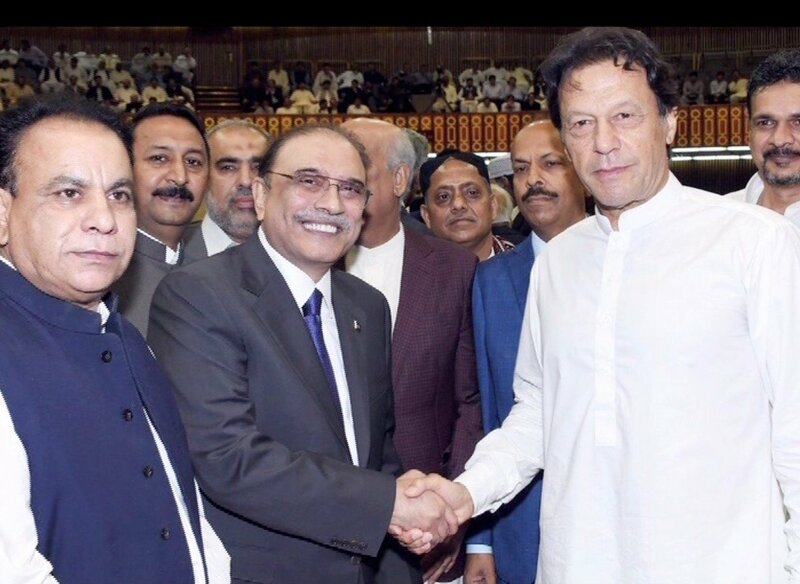 As the PTI bagged majority of seats in the National Assembly after the general election 2018, the opposition parties-perhaps the right wing parties decided to remain out of the parliament but the PPP remained successful in convincing political parties to resolve the matter in the Parliament. It is right for the political alliance to participate in the election of big slots in the parliament so the all parties are doing. However, for this system to function efficiently, the ruling party must attach importance to the opposition and take their recommendations and criticisms into consideration. The ruling party must not have an obsession such as “doing the contrary of what the opposition suggests” as it has been observed previously. On the other hand, the opposition must not forget that it has a very important position in terms of observing the interests of the country and citizens. For this reason, its objections and criticisms must not be based on demagogy intended to wear out the other party. Therefore, the opposition must be meticulous about being honest, rational and conscientious and base its criticisms upon facts, solid data and research. Criticism and tone must not be devastating but constructive. Meanwhile, it will be flawed policy and undue constructive share of the opposition to slam every move of the ruling party, whether it is right or wrong, and pursue insincere policies simply to overthrow the ruling party as in the previous regimes. On the very contrary, it is very important for the opposition to make constructive criticisms and proceed on the tenets of justice and fairness. The opposition must be able to support the truth and applaud it. The honest and sincere stance will definitely be appreciated by the voters and other citizens. Therefore, politicians irrespective of their political affiliations, from the opposition or the ruling party, must assume it their prime responsibility to unite around the truths that will secure society’s interests, peace, security, welfare of the masses. The writer is graduate of School of Economics, Quaid-I-Azam University,Islamabad. His interests include studying the political economy and politics of national and international affairs.